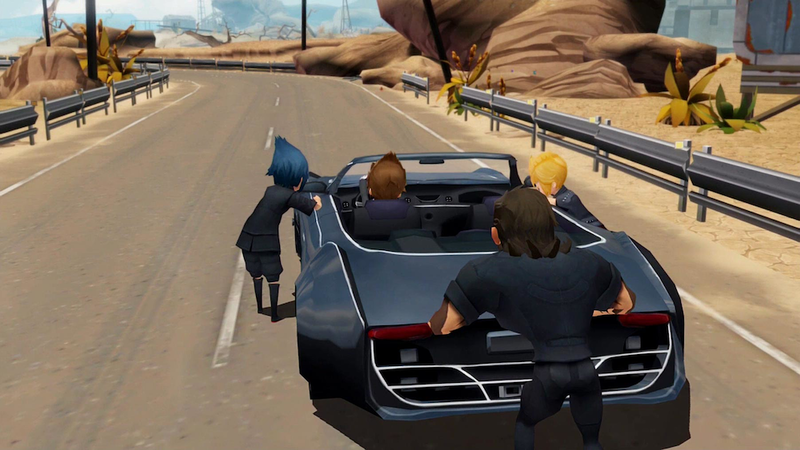 The very existence of Final Fantasy 15 Pocket Edition (Free) is both weird and fascinating. Final Fantasy 15 is the latest in the classic series of JRPGs. It launched last year on the latest home consoles, and on its face certainly didn’t appear to be a good candidate for a mobile release. 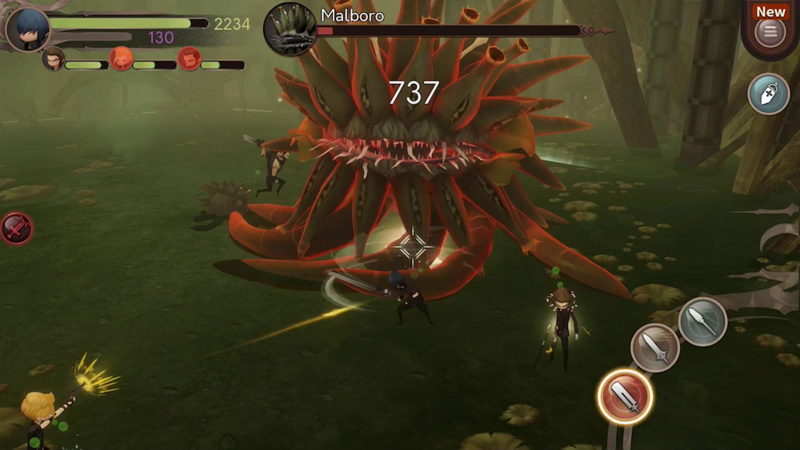 Maybe Final Fantasy 8 next for mobile players? Or even Final Fantasy 10? No, Square Enix clearly wanted mobile players to experience the story of the newest game in the series, and found a way to do just that. Final Fantasy 15 Pocket Edition is Final Fantasy 15… sort of. It’s as though someone had the script and a pretty decent walkthrough of the original game and was told to remake it for mobile devices. Miraculously, it works. 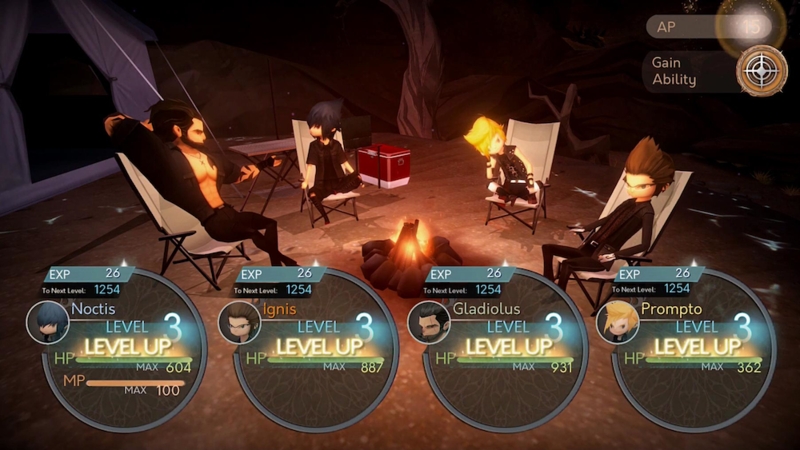 Final Fantasy 15 Pocket Edition, like the original, follows the story of Noctis, heir to the throne of the kingdom of Lucis. On the eve of peace negotiations between Lucis and the empire of Niflheim, things go terribly awry at home. Fortunately, Noctis and his three friends weren’t home at the time, leaving them free to do what is necessary to save the day. That’s basically the beginning of the story, and in true Final Fantasy fashion it soon goes in completely bizarre and occasionally nonsensical directions. The characters are strong, though, and that makes the moment-to-moment happenings of the plot more engaging than its whole. Most of the story from the original version has made the cut here. It’s not a one-for-one re-creation, but it hits all of the important points and tells its story as coherently as it can be told. Of course, it’s all done through the filter of the game’s new visual style, which swaps out semi-realistic high-poly models for a stylistic super-deformed low-poly look. You might think that would ruin the drama of some of the darker scenes, but it works surprisingly well overall. I suppose that’s not that surprising, given the series’ roots lay in super-deformed sprites. On the whole, the story flows a lot better in this version of the game thanks to how streamlined certain aspects are. Let’s talk about that, because it’s really the main story here. Much of the buzz of Final Fantasy 15 was focused around the massive open world that made up the first half or so of the game. You could drive around with your buddies, get in random fights, stumble on and solve side-quests that had nothing to do with anything in particular, and jam out to tunes in your car as you drove around. The same can’t be said for the Pocket Edition, but I don’t think it’s necessarily a good or bad thing. The size of the world has been greatly reduced, and the flow of quests, mini-games, and sub activities have been reduced in scope to go with that. It hurts the game as a vehicle for goofing around, but it makes for a far tighter, more focused game all around. There’s still plenty to do, but you won’t (and to an extent can’t) waste as much time doing it. The combat has also been changed from the console version. It’s still very much action-based, but instead of the original game’s ground-level view that felt like it fell somewhere between Kingdom Hearts and a proper console action game, Final Fantasy 15 Pocket Edition gives you a different angle and a system that works better with touch controls. Battles play out from an overhead position, allowing you to get a clear view of your characters, the monsters, and the area around you. You only have to worry about controlling Noctis, with the rest of your companions controlled by the computer in most respects. Basic attacking is easy, as you simply need to point Noctis at a foe and he’ll start auto-attacking. Timed taps allow you to parry, use special attacks, dodge, and perform warp strikes. It’s a lot easier to play than the original version, but still turns up the challenge nicely when the bosses show up. Beating up monsters will earn you AP that you can use to unlock new abilities, combos, and stat increases for each of your characters in a simplified version of the original game’s Ascension Grid. While it’s not completely free-form the way some Final Fantasy character systems are, it does give you a certain degree of customizability that lets you shape your party as you see fit. As far as the production values go, Final Fantasy 15 Pocket Edition is pretty amazing. How one feels about the new art direction is a subjective thing and the game environments have lost a lot of their luster now that the game isn’t really about exploration. At the same time, it’s incredible just how much of the original game’s atmosphere was preserved here. Certainly it doesn’t hurt that the voice acting, sound effects, and music were carried over more or less directly from the original version. But visually, it manages to convey its themes and feelings even with its hard shift in style. If the original Final Fantasy 15 didn’t exist, I think this version of the game would do just as good of a job in showing off its characters and plot. But how much does it cost? Well, the game is divided into ten chapters. The first is free and does a decent job of letting the player know what they can expect from the full game. The next two chapters are available for $0.99 each via IAPs, while the remaining chapters sell for $3.99 each. If you want to just buy it all in one go, it will cost you $19.99. Essentially, it’s not far off from the model that Square Enix used for the original Final Fantasy Dimensions (Free). It’s not out of line with what Square Enix usually charges for their premium efforts on mobile, and I feel like it justifies that price and then some. I think the really impressive thing about Final Fantasy 15 Pocket Edition is that whether you’ve played the original game or not, you’ll probably find a lot to love here. For fans of the console game, this is a quicker, abridged take on the story and characters you came to love. It’s different enough to justify an additional playthrough, but similar enough that it doesn’t lose what the console version was going for. If you’re new to the game, you’ll find a grand Final Fantasy adventure that feels tailor-made for mobile in all the right ways. It’s enjoyable to play, the pace is excellent, and even if the story gets a little iffy in places, it’s hard not to fall in love with the main cast. I still can’t believe this worked, but it did, and it did so in fantastic fashion.